Hotel "Aziza" is located in the heart of Old city, Baščaršija. Placed above Kovači, next to Vratnik Gates, it offers panoramic view of the Old town and most of the city. The Hotel is located between one of the two city landmarks. 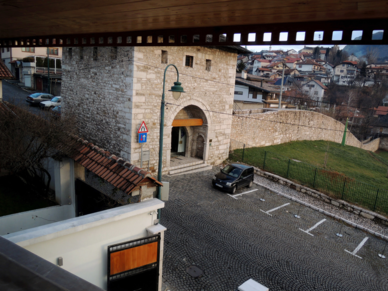 Across from the very entrance you can find Museum "Alija Izetbegović," dedicated to the first President of the independent Republic of Bosnia and Herzegovina. At the back of the Hotel is Saburina House, one of the few remaining gems of residential architecture of the Ottoman period. Baščaršija, the Old Craft Center, is the most visited and the most interesting part of the city, placed just five-minutes walk from our hotel. Near the Hotel you can also find the Sarajevo City Hall, one of the historical builds that once was a home to National and University Library. There are numerous museums and many religious buildings in the vicinity of the Hotel. Part of the city where our Hotel is located allows tourists to walk and explore old alleys and to feel how people once lived in Sarajevo, its narrow streets, small shops, the neighborhood and the mentality that managed to retain their shape even today. In a ten minute easy walk up the hill from the Hotel, you can reach Žuta tabija that offers you spectacular view of the town, as well as the old army fortress Jajce, which is located in the immediate vicinity of Žuta tabija. Numerous restaurants, ćevabdžnice (meat finger shops – Bosnian fast food), pubs, cafes and patisseries are offering rich choice of traditional Bosnian cuisine, where everyone can find something for themselves - from Sarajevo kebabs and all kinds of pies, to stews and sweets typical for our city. Our Hotel staff will help you with information regarding day trips as well as other sites that you can visit during your stay in Sarajevo. We also organise guided sightseeing tours, so all you need to do is to ask our friendly staff at the reception! We wish you a pleasant stay in our hotel and the city of Sarajevo!